One of the best ways to keep your diet exciting without getting off track is to have fun with veggies. High in fiber and low in calories, vegetables are the ultimate clean-eating companions. Now, I’m not one of those people who can snack happily on raw veggies. Boring. Rather, I love my veggies steamed, grilled, sautéed or, especially, roasted. Roasting your veggies gives them a slightly sweet taste that can melt the hearts of the stone cold veggie haters. Roasting can even turn bitter Brussels sprouts into caramelized yumminess. 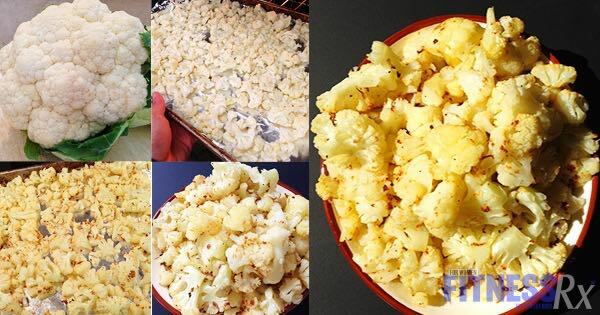 My latest roasted veggie obsession is Cauliflower “Popcorn.” I love to eat these tasty little florets as a sweet snack or a savory side dish. (Yes, I really throw them in a bowl and eat them like popcorn.) I vary up the seasoning from cinnamon to Parmesan cheese to chili pepper with cumin, depending on my mood. Cauliflower’s flavor is very neutral, so you can get creative! Besides being tasty, cauliflower has numerous health benefits including being a powerful antioxidant, detoxifier and anti-inflammatory. I could go on and on, but you probably are ready for me to just get on with the recipe. So, let’s get to it! 2. In a large bowl, combine the cauliflower, seasoning and oil. Make sure each piece is coated. 3. Transfer to a baking sheet and spread in a single layer. Place in oven for about 18-20 minutes. Stir every five minutes to ensure the cauliflower is getting browned on all sides. Getting into a comfy routine with our nutrition is definitely a good thing. But, introducing a little diversity from time to time will not only nourish our bodies with a wider range of nutrients, it will also keep our mouths entertained and cravings satisfied. The result? We are less likely to cave into a binge brought on by nutritional boredom and more likely to stay on track to our best!